SpaceX personnel and NASA astronauts stand in front of the in-work Crew Dragon on Aug. 13, 2018. 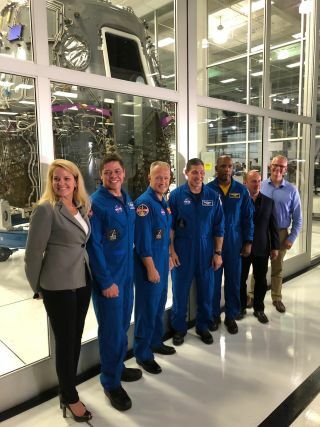 From left to right: SpaceX president and COO Gwynne Shotwell; astronauts Bob Behnken and Doug Hurley, who will fly the first crewed test mission of the capsule; astronauts Mike Hopkins and Victor Glover, who will fly the first operational Crew Dragon mission; former NASA astronaut Garrett Reisman, SpaceX’s senior advisor for human spaceflight; and SpaceX director of crew mission management Benji Reed. HAWTHORNE, Calif. — The first crewed flight of SpaceX's new astronaut taxi is less than a year away, and its participants can't wait to get off the ground. SpaceX's Crew Dragon capsule is slated to fly veteran NASA astronauts Bob Behnken and Doug Hurley to and from the International Space Station (ISS) on a test mission in April 2019, provided that an uncrewed flight to the orbiting lab this November goes well. That milestone will mean a lot to Behnken. During a media event yesterday (Aug. 13) here at SpaceX headquarters, he stressed the importance of returning human spaceflight to the United States. "For those of us who've launched on space shuttles, it was just something special for us to go through," said Behnken, who flew on two shuttle missions, both aboard the orbiter Endeavour, in 2008 and 2010. "It was special for our families to be able to see that, the schoolkids and folks that we try to bring our missions back to and inspire, or at least share our experiences with. It's a little bit different if they can do it in their own backyard, and I'm just really happy to be a part of that process." The Crew Dragon capsule that will make the vehicle’s first crewed flight — currently scheduled for April 2019 — under construction in a clean room at SpaceX headquarters. Behnken and Hurley are former test pilots, as are the two NASA astronauts who will fly on the first operational, contracted Crew Dragon mission to the ISS, Mike Hopkins and Victor Glover. All four space flyers were present at yesterday's event, which was held in front of a SpaceX clean room containing the under-construction capsule that Behnken and Hurley will ride. SpaceX President and Chief Operating Officer Gwynne Shotwell was also there, as were SpaceX Director of Crew Mission Management Benji Reed and former NASA astronaut Garrett Reisman, the company's senior adviser for human spaceflight. Behnken, Hurley, Hopkins and Glover all described the opportunity to break in a brand-new spaceship as a dream come true. "As we've all said, being able to fly a first flight of a vehicle as a test pilot is a once-in-a-generational type of opportunity," said Hurley, who also has two shuttle missions under his belt, including the final shuttle mission, the STS-135 flight of Atlantis in July 2011. But, he added, "We are in it for the long haul. We're going to make these vehicles great for our friends back in the astronaut office that maybe haven't even gotten hired yet that are going to fly these vehicles someday. So, we take that job very seriously — to make this the best possible spaceship that we can make." Flying the Crew Dragon will be very different from piloting the space shuttle or a fighter jet. The new spaceship has neither a joystick nor a yoke, just a set of controls arrayed on large touch screens. And the astronauts won't have to tap those controls much, if all goes according to plan. Crew Dragon is designed to be autonomous, and the first backup layer resides at mission control on the ground, SpaceX representatives said during yesterday's event, which also included a tour of some capsule mock-ups and training gear. Crew Dragon and Starlinerare designed to fly up to seven people, though both capsules will fly a maximum of four astronauts on their NASA-contracted missions. At the moment, there are six such flights on the books for each private spacecraft; these operational missions will begin after the crewed test flights and a subsequent certification process, NASA officials have said. NASA unveiled the pioneering commercial-crew astronauts earlier this month. Eric Boe, Nicole Aunapu Mann and Chris Ferguson were selected for the first crewed test flight of Starliner, and Sunita Williams and Josh Cassada were chosen to fly that vehicle's initial operational mission to the ISS. Oh, and about those target launch dates: They're not set in stone. The crewed-flight schedules for both SpaceX and Boeing have slipped multiple times over the years. Shotwell expressed confidence that Behnken and Hurley would indeed get off the ground in April 2019, but there are no guarantees in spaceflight. "We are not going to fly until we're ready to fly these folks safely," she said yesterday. "So, first and foremost, safety is going to be our primary concern."